Forget 'Twitch Plays Pokémon.' Now there's another madness-inducing multiplayer take on a game that was never meant to be played by more than one person. 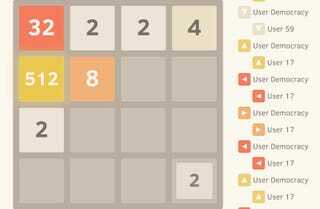 Normally, you play 2048 as a puzzle game where you try to combine tiles that are multiples of 2. In this version, you still do that, only you have to deal with all the inputs from random people on the internet—which makes the game a tad more hectic, and potentially troll-able (read: more fun). Not everyone playing with you is gonna try to go for 2048, after all. And if you're just not feelin' this, remember: you can always play Threes, the original game that gave rise to 1028, and eventually, 2048 itself.